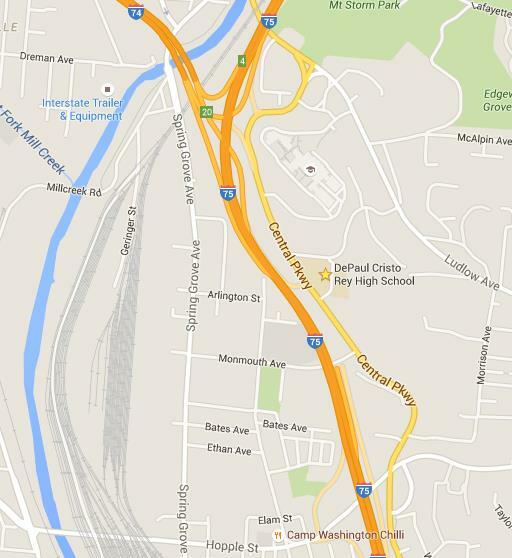 DePaul Cristo Rey High School is located on the corner of Central Parkway and Clifton Hills Avenue, one block south of Cincinnati State Technical and Community College. The main entrance and parking are best accessed from Clifton Hills Avenue. Exit I-75, north at Hopple Street. Turn right and at the next light, turn right onto the Central Parkway connector. Turn right onto Central Parkway. Drive 3/4 mile on Central Parkway and you will see the school on the right. Turn right onto Clifton Hills and turn into the first driveway to the right with the main entrance immediately to your right. Exit 1-75 south at Hopple Street. Turn left onto Hopple Street. At the second light, turn right onto the Central Parkway connector. At the next light, turn right onto Central Parkway. Drive 3/4 mile on Central Parkway and you will see the school on the right. Turn right onto Clifton Hills and turn into the first driveway to the right with the main entrance immediately to your right. There is no longer an exit ramp from I-74 east directly onto Central Parkway. Now when driving east on I-74, at the merge of I-74 and I-75, go south onto I-75 and exit at Hopple Street. Turn left onto Hopple Street. At the second light, turn right onto the Central Parkway connector. At the next light, turn right onto Central Parkway. Drive 3/4 mile on Central Parkway and you will see the school on the right. Turn right onto Clifton Hills and turn into the first driveway to the right with the main entrance immediately to your right.